Thanks for checking in with us regarding the real estate market in sunny Big Bear Lake CA. The 2nd Quarter of 2017 is now "in-the-books," so let’s catch up on the happenings in the Big Bear real estate market, shall we? The story so far in 2017 has been one of healthy demand for Big Bear vacation homes. 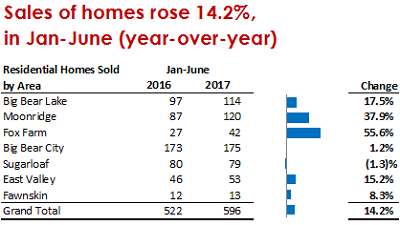 The total number of residential sales from January through June 2017 vs. the same period in 2016 increased a substantial 14.2% (596 in 2017 vs. 522 in 2016). Moonridge and Fox Farm were the areas that saw the lion's share of this growth in sales with a 37.9% rise in Moonridge (120 in 2017 vs. 87 in 2016) and an incredible 55.6% increase in the Fox Farm area of Big Bear (42 in 2017 vs. 27 in 2016). Check out our website for more information and to see properties available in these and other popular areas. Also interesting to note is that the distribution of sales in different prices ranges has changed dramatically. In the past, it has been the price range of $0 - $250,000 and more recently also that of $250,000 – $500,000 that have benefited most from the boost in number of sales. So far this year however, the price range of $500,000 - $750,000 is up 30% (39 sold Jan-June in 2017 vs 30 in 2016) and the price range between $750,000 - $999,000 has seen a whopping 166.7% surge (16 sold 2017 vs 6 in 2016). To search for properties by price or area, visit the Simply Search page on our website. With so many more properties changing hands this year than last, to what can we attribute this considerable increase in demand? While interest rates are currently still at historically low levels, they have been on the rise of late and experts predict to see a 5.5% - 6% rate on 30-year fixed mortgages by the end of 2019. So, many are looking to buy now and lock in a great rate on an awesome vacation home in Big Bear. That, coupled with increased optimism about Big Bear’s potential for growth (with our two local ski resorts being recently purchased by Aspen Ski Co.), seems to have brought a lot of would-be buyers off the fence and into escrow in the first half of 2017, which is really good news for all concerned. 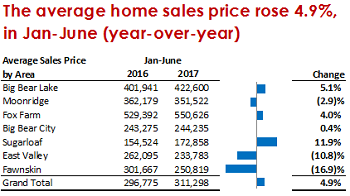 The average price of all residential homes sold January – June 2017 vs. the same period of 2016 has increased 4.9% (from $296,775 in 2016 to $311,298 in 2017). This price appreciation in Big Bear, although slow and steady as compared to many areas, has certainly been bringing more sellers to the market. But so far anyway, demand has been able to keep pace and absorb most of this new supply. Even though we currently have 553 Active listings (vs. 379 in the middle of April), based on the number of homes currently in escrow and on a typical 45-day closing period, this equates to a 4.8 month supply (up from 3.8 months in April). Keep in mind that 6 months of supply is considered a "balanced market"; whereas, 8 months of supply is considered a strong "buyers-market" and 4 months and below a strong "sellers- market." As the year continues, it will be very interesting to see if a rising number of Big Bear buyers scoop up enough homes to keep up with the expanding inventory. Or if not, perhaps the later part of 2017 will evolve into more of a "buyers market." Stay tuned, as we will keep you posted and do let us know if you have any questions on the market, on anything you see for sale here, or on your homes current value. We are happy to help and look forward to hearing from you. Until next time: All the best and happy hunting! Posted in 2017 Posts on July 13, 2017 by Mike Sannes.